Gorgeous early evening light blessed this couple's wedding ceremony in New Orleans City Park's Botanical Garden. The ceremony was beautiful, with the bride's brother (whose wedding I had photographed several years before) singing as part of a four-person choir. In addition to being a gorgeous location for a ceremony, being directly adjacent to the popular reception venue Pavilion of the Two Sisters is very convenient and helps take away much of the stress of transportation for you and your guests. 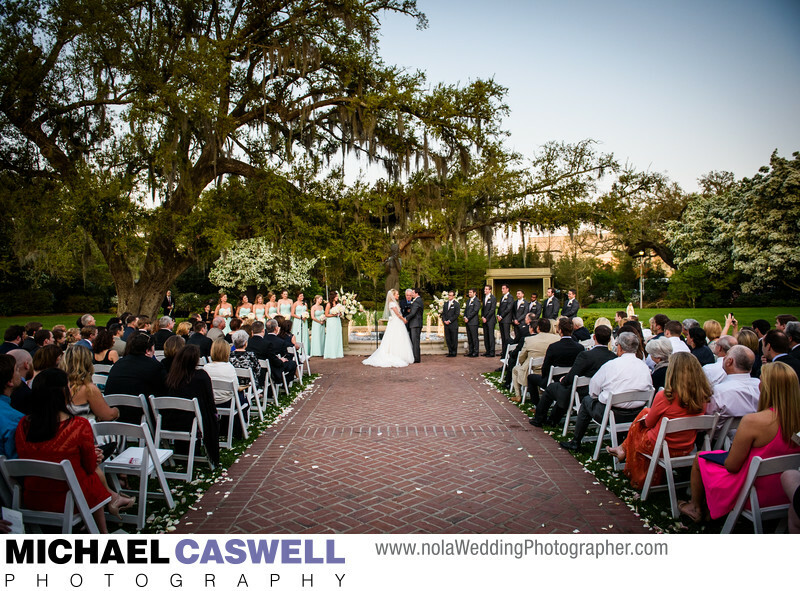 The large, round fountain in this spot, along with the large oak tree with beautiful moss gracing the background, and the aesthetically pleasing brick patio, all contribute to this being an attractive setting for a perfect outdoor wedding ceremony. Scheduling your ceremony start time to be about twenty to thirty minutes before sunset results in this kind of beautifully soft light at this location most times of the year. While it's not always possible to perfectly time your wedding to coincide with the best light, it's definitely worth trying to if you can. City Park also has several other venues where wedding ceremonies can take place, including the Peristyle, Popp Fountain, the Conservatory, and other areas of the Botanical Garden. Location: 101 Victory Ave, New Orleans, LA 70124.